Kerry-Sue's Scrap Share: Yay! $2 shop!! Don't we look cool? 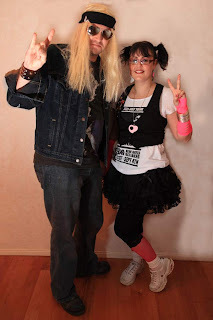 I had heaps of fun finding our costumes & it's AMAZING what u can get at the $2 shops! Had a fun time drinking (more than ever before) & dancing to the 80's music. I enjoyed the 80's more this time round!! They had '16 Candles', 'St. Elmos Fire' & 'the breakfast Club' movies playing in the background. They were only missing 'Werid Sceince', LOL! Most of the guest got into the spirit & dressed up, so that was good. hehe you guys look cool! but whatd you buy at NZ scrap!! !